I'm currently taking a poll in my Instagram Stories asking you what types of recipes you'd like to see on the blog leading up to Christmas and so far "Chocolate" and "Cookies" is taking the lead. 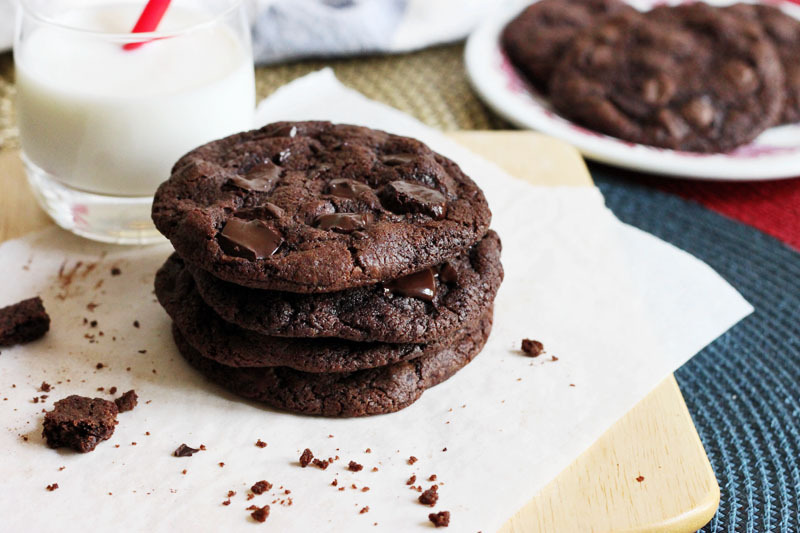 So here we have Extreme Double Chocolate Cookies! Thanks to everyone who voted! 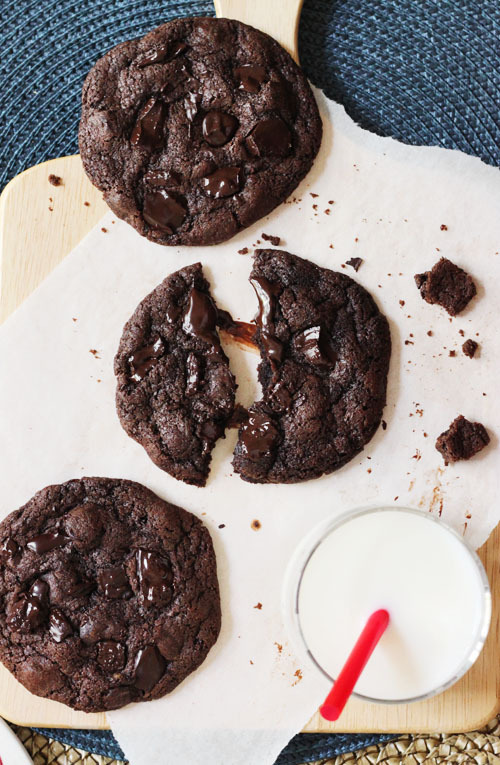 There is a lot of chocolate going on in these cookies. There is also a lot of chewy. Those are two things I am totally down with and I hope you can get down with them too. What makes these cookies so deep dark is of course dddddddark cocoa, but what gives them this especially midnight tone isn't just the colour of the cocoa itself, but its chemical characteristics. Dark cocoas get their deep colour from being alkaline, or having a high pH. pH is a measure of acidity. It ranges on a scale of 1 to 14 --- 1 being very acidic and 14 being very basic (think sodium hydroxide, bleach and soap!). If a pH is lower than 7, it is considered to be acidic and it if is higher than 7 it is considered basic. Water is generally neutral at pH near 7. Dutch processing is a method of treating cocoa with an alkalizing agent to alter the chemical composition. This process enhances colour, making deep red tones and black cocoa. However this also raises the pH and affects the taste. Generally, the higher the pH, the darker (more black/brown) the cocoa becomes. 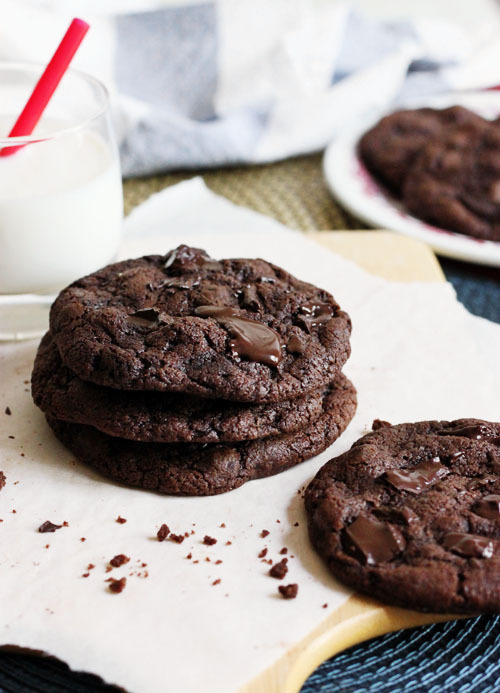 The alkalinity of dark cocoa also makes these cookies crispy on the edges. At high pH, caramelization reactions happen faster so that sugar will cook quicker. It also means that the dough will set more slowly so that they will spread slightly more. 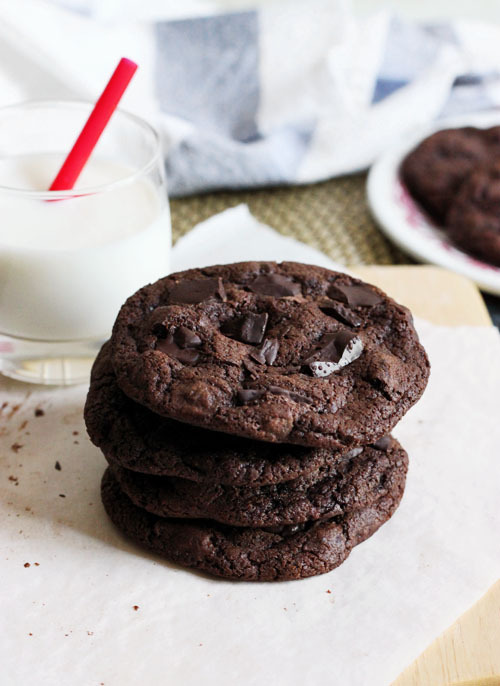 The result: deep dark chewy chocolate cookies with super crisp edges. Another key to crisp is baking powder. I rarely use baking powder in drop cookies like this when I want a super soft and chewy interior, but what it does here is create a bunch of tiny air bubbles that dry out the edges and make them crispy. 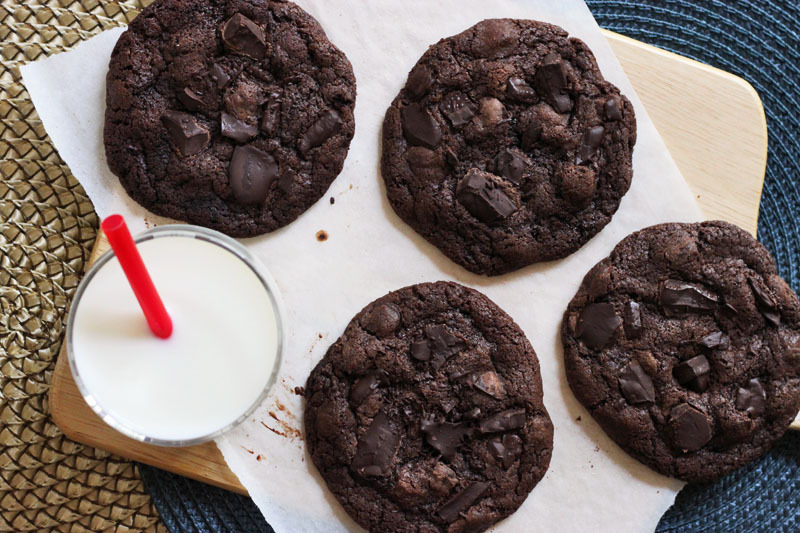 If you wanted to completely transform this cookie to soft and chewy all around, then increase the flour to 1 1/3 cups (190g) and eliminate the baking powder. I'd also use a natural or lightly Dutched cocoa powder. Bingo! 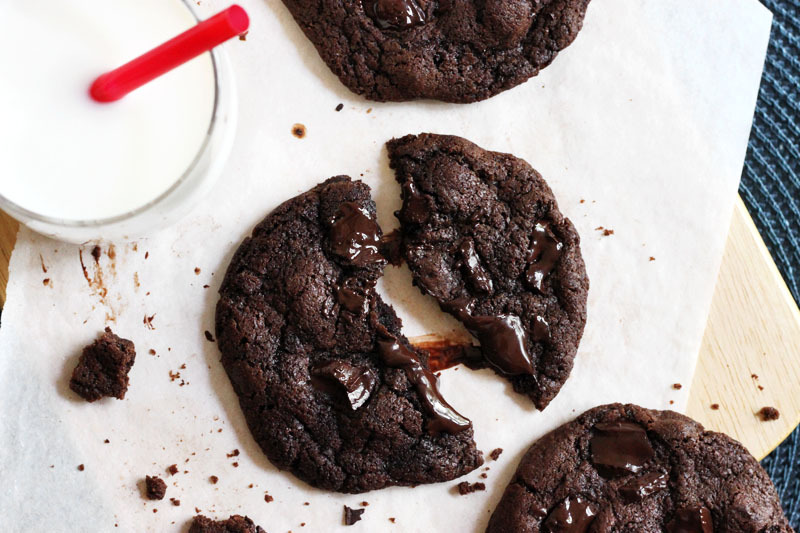 How do you know a chocolate cookie is ready when it looks so chocolaty? Good question. It's hard to tell something is golden brown when its original colour is already browner than brown. So, you have to go by touch and instinct here. Just stick to the timing of 10 minutes. They will still feel soft in the middle at this point but trust that they will set on cooling. If you cook them further then they will end up very crunchy through and through which isn't bad if you like crunchy cookies - so make the call based on your taste. PS - the crunchy version is made for dunking in milk! 12-14 minutes for crunch all the way! Beat together butter and both sugars in a medium mixing bowl until smooth and creamy. Beat in honey and then the egg. Mix in salt, baking soda and baking powder so it is evenly blended and then stir in cocoa powder until combined. Add flour and fold it in until blended before folding through the chocolate chips. Cover the dough and chill for 1-2 hours. Preheat your oven to 350°F. Line two baking sheets with parchment paper. Roll heaped tablespoons of dough into balls and place onto prepared baking sheets, spacing them 2 inches apart. Flatten them down slightly using your fingertips and place a few bittersweet chunks on top. Bake until slightly cracked at the surface, about 9-10 minutes. Let them set for a minute on the trays before transferring to a wire rack to finish cooling.